Phyl's Blog: SNAP, CRACKLE OR POP? Today it finally arrived, literally five minutes before I was serving her breakfast. She was so excited. 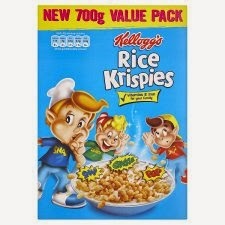 Looking round the bowl at the Snap, Crackle and Pop characters she suddenly asked: 'Which one do you like best mum? The one with the duck on his head, the one with the mashed potato or the one with the snail?' That's a novel way of looking at it I guess!